Everything seems enhanced in the summer. The days are longer, the colours are brighter and the opportunities are greater. Boundless sunshine and warm evenings give us the chance to escape our rigid daily routines and seek adventure in the great outdoors. Our senses are galvanised, alert to the vitality of nature that flourishes in the summer heat. The summer months also breathe new life into the canvases of artists. Landscapes are transformed as flowers come into full bloom and coastlines shimmer in the unwavering sunlight. 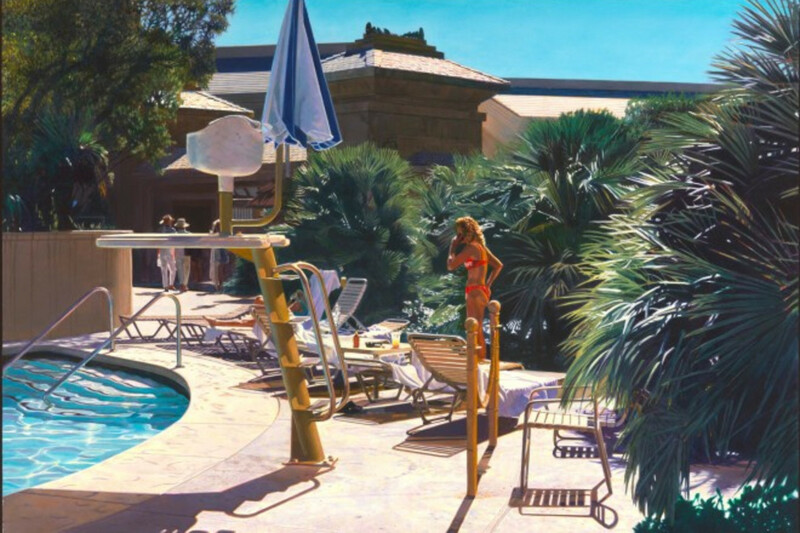 Hyperrealism is able to expose the beauty in these scenes, enhancing aspects to best evoke the exhilaration and beauty of summer. In celebration of Plus One Gallery’s 2016 Summer Show, we’re taking a closer look at the artists that capture the summer months in all of their undisputed glory. Whether it’s ocean waves lapping onto the shore or swimmers taking a refreshing dip in a pool or lake, water has been used as a symbol of summer for decades. The most iconic aquatic scene is arguably David Hockney’s “A Bigger Splash”, a stunning poolside painting of blazing afternoon in 1960’s California. 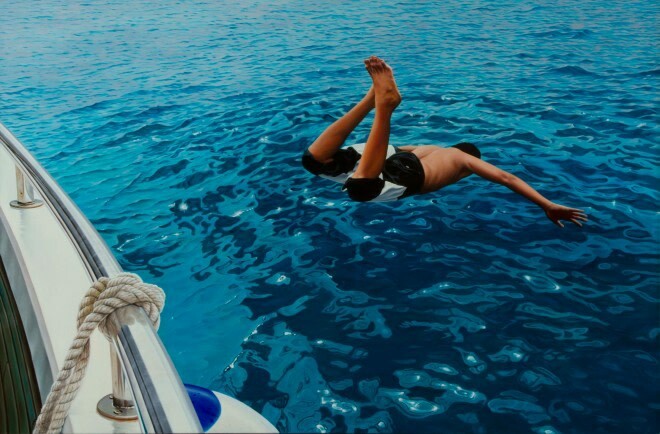 Inspired by Hockney, many hyperrealists have continued to explore the relationship between water and the summer. New York-based artist Matt Story explores the underwater world, depicting bikini-clad women diving or in mid-stroke beneath the surface of pools or the ocean waves. Beyond the clear connotations to the fun and relaxation of summer, Story uses water as a metaphor for the deeper self. “We drink, wash, drown, float, swim and splash our way through life. When I paint a woman floating underwater, I see her as suspended in her own self awareness. She’s immersed in the deeper self, with its risks and fears, and then her emerging takes on a sense of re-birth, a cleansing, a baptism. Of course, water also has a fun playful side. We all share those memories of fun and relaxing summers at beaches and pools, immersed in joy." Other hyperrealists take a more playful approach to their aquatic paintings. Mike Francis combines his history as a commercial illustrator with his love of the coast to produce vibrant compositions with a distinctive summer narrative. Often featuring a female figure accompanied by a dog, some of his creations bare a resemblance to 1950’s postcard illustrations. Working from personal photographs and his collection of vintage magazine cuttings, content is equally key to Francis's work as is the technique. He has often said he learnt how to tell a visual story through composition and colour during his years as a draughtsman, and cites realists Edward Hopper and Andrew Wyeth as two of his greatest influences. Portuguese artist Gustavo Fernandes also uses bold colours in his paintings of photographed summer scenes. Fernandes carefully selects specific instances which he believes carry an atmosphere worth bringing to life through painting, whether it’s women lazing on a boat on a hot summer’s day or a man diving into azure blue waters. Landscapes are illuminated in summer, brought to life in the glow of radiant sunlight. Some of the most beautiful images are those of destinations basking in the summer sunshine, brimming with colour and warmth. Using oils and acrylics, many hyperrealists reproduce these spectacular vistas, transporting the viewer into the summer scene and evoking a real sense of escapism. In “Panerai Classic Yachts Challenge, Cannes”, Christian Marsh transports us to the French Riviera where a moored luxury yacht rests in the calm waters of the Mediterranean Sea. Marsh uses photography to document compositional elements, lighting and moving objects at a given time. His description of light alters according to the seasons and the architectural influences of each city. In the same way a writer conveys the essence of a destination through sound, smell and taste, Marsh does the same with colour and light. Spanish artist Luis Perez has an extraordinary ability to capture light in urban environments. 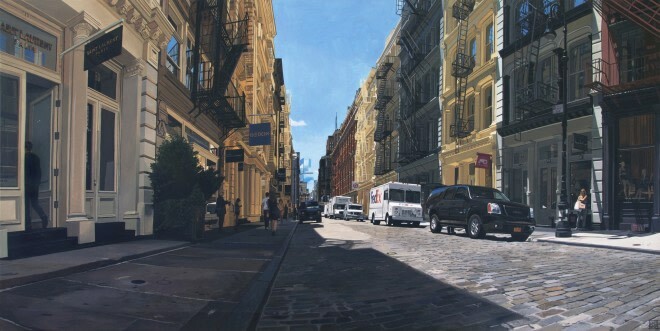 “In Greene St/Soho”, he explores the relationship between architecture and sunlight. On what is perceived to be a warm summer’s day, one side of the street basks in the sun’s glow, while the other is shaded by the terrace of high rise buildings. Steve Perrault also evokes the exhilaration of summer with his intensified acrylic landscape paintings. 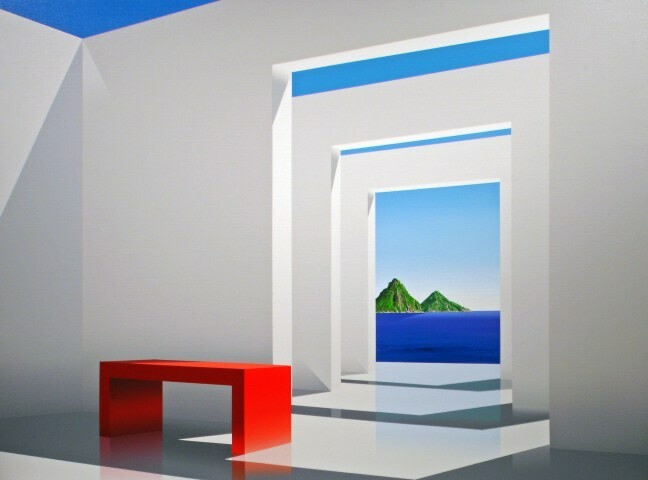 Often featuring a white-walled structure that looks out onto an island paradise in the distance, Perrault’s compositions are a distinct aesthetic in contemporary metaphoric realism. These paintings express harmonious environments of honesty, tranquility and moments of introspection. Creating scenes of serenity and exoticism, his work allows the viewer to escape into another reality.